These little furry animals that fly seem to be half-bird, half-mammal, and ugly to look at. But in these times of conservation consciousness, they are being properly recognized as valuable assets to mankind and the ecological sys tem. A single little brown bat can eat 3,000 to 7,000 mosquitoes each night. Bats are the world’s most important predator of night-flying insects. Bats are generally quite harmless to people. They very rarely bite or carry disease and are less likely than domestic pets to carry rabies……..and they are too smart to get tangled in your hair. Bats sleep during the day and hunt at night. They are the only mammals that can fly. Baby bats are born alive – they are not hatched from eggs. Bats can fly as high as 10,000 feet and travel as fast as 60 miles per hour. Using only sound, they can follow and catch prey in total darkness. This amazing sonar system is called echolocation. Many bats hibernate during the winter but as Halloween approaches, they seem to take the spot-light. Like many other species that roost or nest in hollowed-out houses, bats are feeling the housing crunch. Their favorite roosting sites – in old hollow trees, barns, and old houses – are rapidly disappearing. As a result, bat populations are declining at an alarming rate. 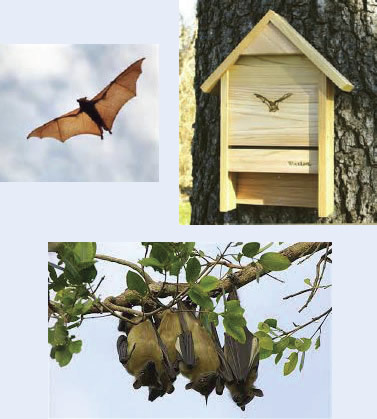 If you are interested in helping bats, consider attracting them to your yard by providing a place for them to live. It seems odd to honor an animal that is so widely despised, but did you know that October is “Bat Appreciation Month?”.